Whitewater Valley Gorge Park spans from Test Road to Waterfall Road. It is 100 acres. The gorge walls contain bedrock that illustrate the geological history of the area, dating back some 500,000,000 years. The gorge runs 3-1/2 mils through Richmond and ranges from 200-300 feet wide and 50-80 feet deep. 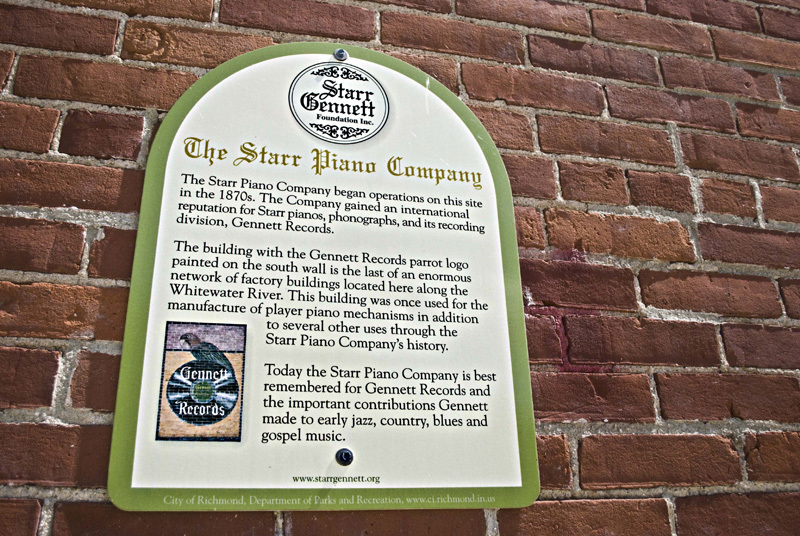 "The Starr Piano Company began operations on this site in the 1870s. The company gained an international reputation for Starr pianos, phonographs, and its recording division, Gennett records. The building with the Gennett Records parrot logo painted on the south wall is the last of an enormous network of factory buildings located here along the Whitewater River. This building was once used for the manufacture of player piano mechanisms in addition to several other uses through the Starr Piano Company's history. Today the Starr Piano Company is best remembered for Gennett Records and the important contributions Gennett made to early jazz, country, blues and gospel music." Wayne County Veterans Memorial Park P.O. Box 2401 Richmond, Indiana 47375. With Whitewater Valley's combination of amenities, the location might just be the perfect fit for your upcoming event. Look through the Shelter Rentals to find the right location for you.